Although it's odd to admit, in truth this is High Range Faith walking on water. 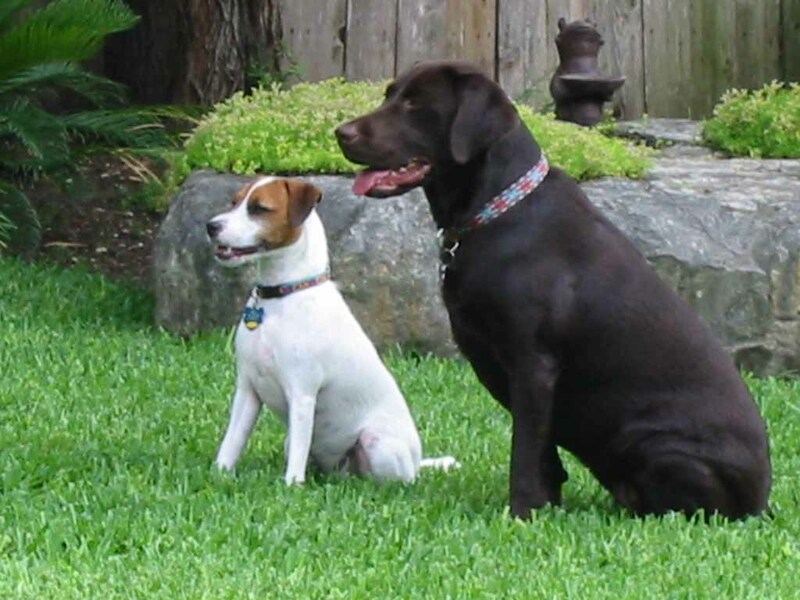 This page features our High Range pups after they have left our nursery for great lives. 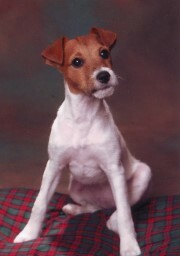 Some High Range terriers have won top honors in the show ring and excelled in the field as hunters, like their parents. 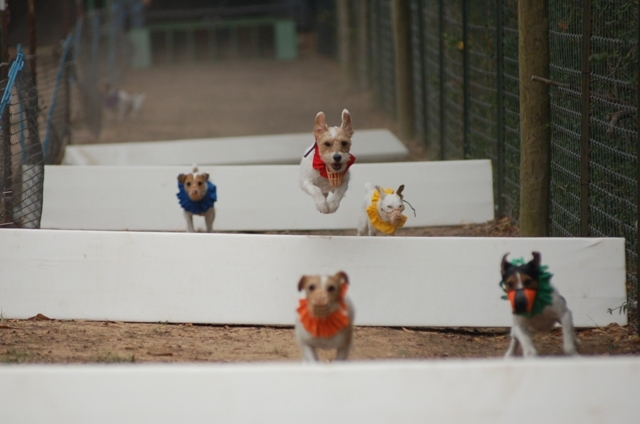 Others have become super agility, flyball, or racing competitors. 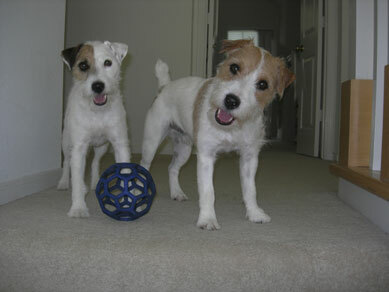 We are proud that some High Range JRT's are certified therapy or search & rescue dogs. 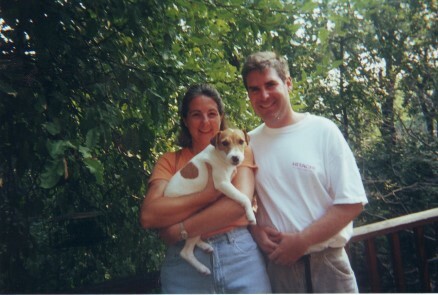 Most High Range pups become family members in loving homes. To make us mortals feel comfortable, Faith also swims sometimes. We hear that Ginger is a natural in the water and loves everyone. You guessed it - Ginger is a sister of Faith! 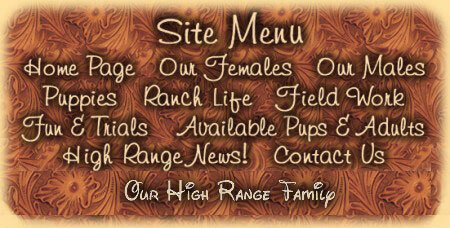 We love to hear about the lives of our High Range babes and welcome photos and news about them. We invite our extended High Range family to send photos that we can share on this page. We have omitted some owners' names to respect their privacy. Approaching the Speed of Light !!! High Range terriers can soar!!! This is Thursday Next, named after the heroine in a wonderful series of detective novels by Jasper Forde. 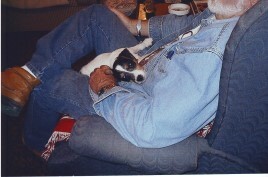 The heroine was filled with courage and pluck just like this fine dog owned by the Spenglers of Houston. Thursday was invited this year to compete in the national championship dock dog competition. She excels at anything athletic and fun. 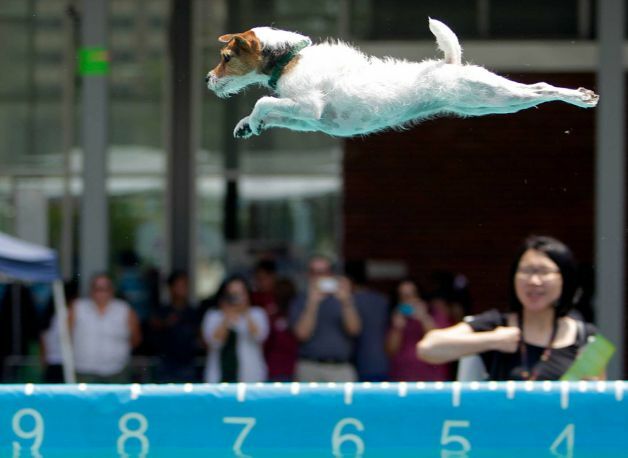 In addition to walking on water, many Jack Russells find "flying" a cinch. Here is handsome Capote soaring! Yet another High Range Flyer ! 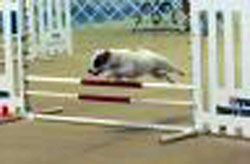 Here is High Range Calumn competing in agility. Wow ! 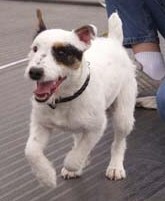 I am so impressed and grateful that High Range JRT owners so devote their time and energy in giving such great lives to our pups. Does Calumn look happy or what? 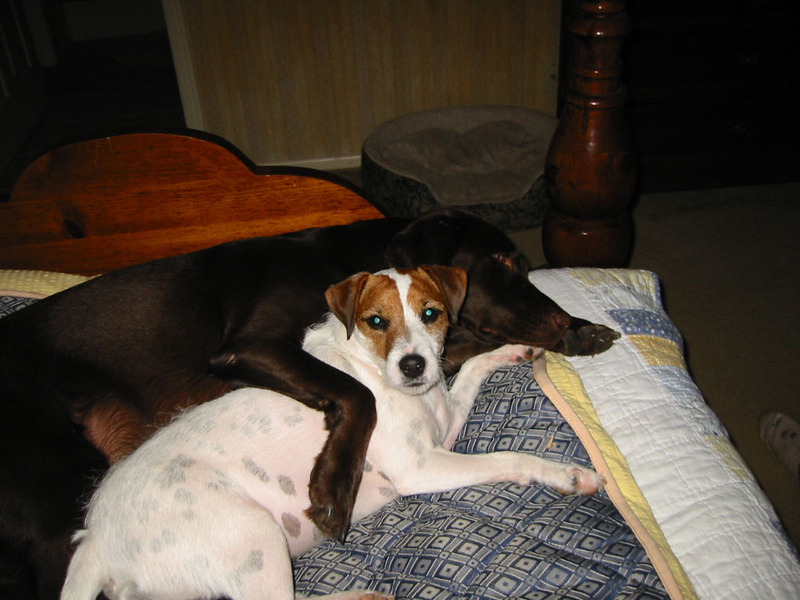 Here our Chisum - aka 'Chissy' enjoys fun times with her family. After winning many conformation championships and giving us beautiful pups, we gave Chisum the best of prizes: home with a family of three young girls and lots of toys! Darci lives in the lap of luxury with Faye and Roy, super owners. Whistle lived a great country life with many adventures. 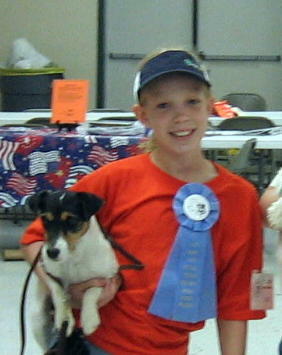 High Range Nora and a great handler, equestrian, and dear friend Emily win first in the Youth Division of a terrier trial. The joy on both Nora's and Emily's face has much to do with my passion for the one and only... JRT. 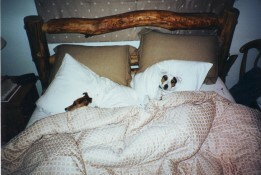 After a long day in the mountains, Stubby enjoys a nice warm mountain bed with his pal. 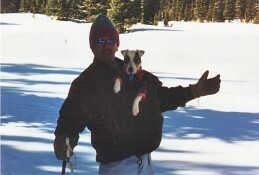 Stubby shares his family's outdoor athletic life in the Colorado Rockies. Winter and Summer, Stubby has fun. High Range Chase has a fantastic life at home, in diverse competitions, as a therapy dog in training, and as a high quality stud dog. Here we have High Range Rumble. He is the only litter mate of our National Champion High Range Mari. 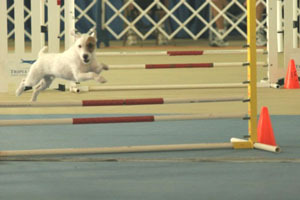 Rumble is quite the athlete and now competes in major Flyball events. 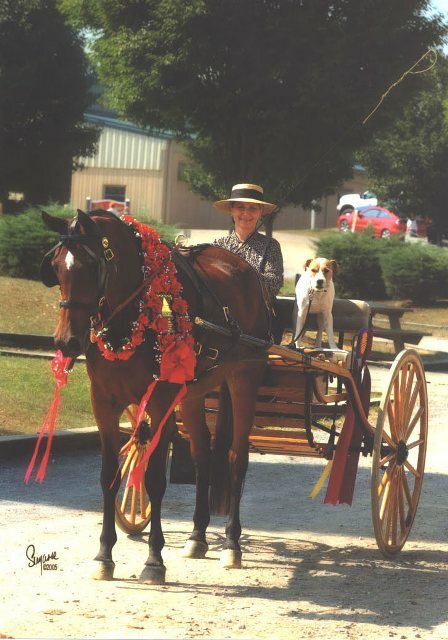 When Sparky is not 30' up a tree, he gets all cleaned-up and competes in Horse and Carriage competitions! 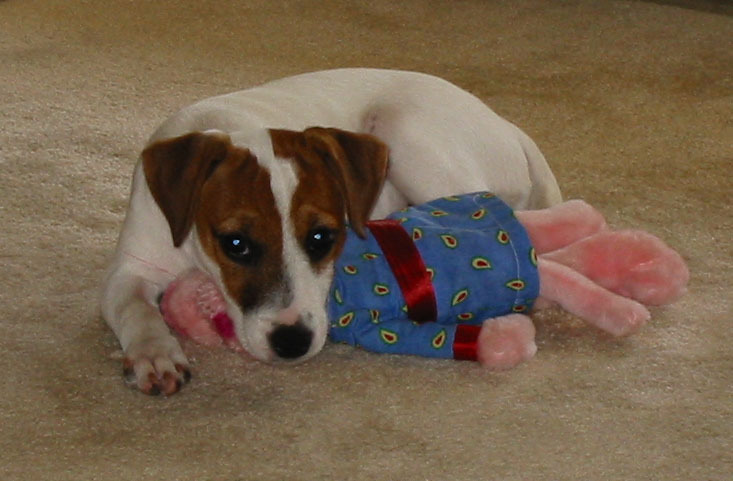 JRTs. of course, are the most versatile of dogs. 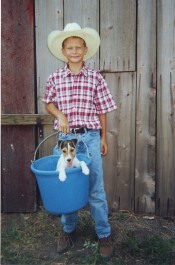 I hear that Sparky has many adventures and enjoys being the chief of security at a horse barn. 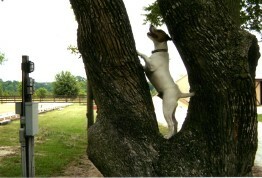 Here, he has found a criminal squirrel in the tree above him. 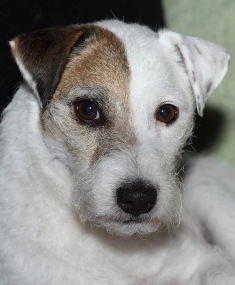 Lizzie has a devoted family with children to play with everyday. High Range Snoop and High Range Annika live a fun life in the Houston area. How much Snoop reminds me of his father Luke and how much Annika reminds me of her Mother TipTop. Bravo High Range Austin and High Range Davis! 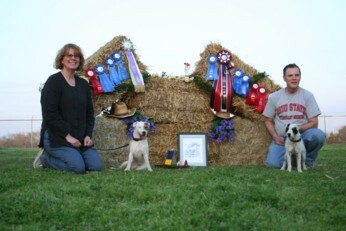 Through the committed and skillfull training from our dear friends the McMahons, the agility achievements and awards won by these High Range dogs have no limits. High Range Davis - aka "the Ferrari!!!" Davis is a son of our Luke and Hope. 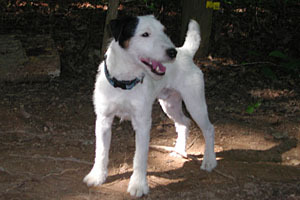 He is a big strong terrier with his father Luke's sweetness. Davis has won many conformation Bests and Championships. 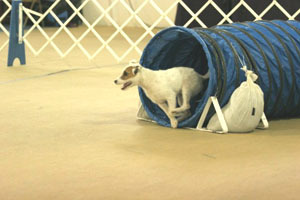 Owned by cherished friends in San Antonio, Davis also has become a world-class agility competitor. He is so fast that he earned the nickname "The Ferrari".